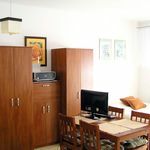 Rooms, services Guests looking for accommodation in Lublin are welcome to book a nicely furnished room at Apartament Orkana Lublin. The apartment welcomes small pets for your stay for an extra fee, allowing you to take your four-legged friend with you. In case you'd bring your laptop along, you may go online via wireless Internet connection (WiFi) available at the apartment. You can find the exact list of services provided by Apartament Orkana Lublin (including those for extra fees) and the exact equipment of the rooms on the information sheet below and on the information sheet of the respective rooms. Arrival, opening hours The earliest time to arrive is 14:00, the latest time to leave the rooms is 10:00. The personnel is at your service in Polish and Russian languages. Reserve your accommodation and Apartament Orkana Lublin will directly send the confirmation in 1 workday.